Mobius Bionics announces the launch of its groundbreaking prosthetic arm beginning late 2016. MANCHESTER, N.H.--(BUSINESS WIRE)--Mobius Bionics LLC is pleased to announce the commercial introduction of the LUKE arm. The LUKE arm is the first prosthetic arm cleared by the US Food and Drug Administration (FDA) in the new product category for integrated prosthetic arms. Developed by DEKA Research & Development Corp. (DEKA), the LUKE arm incorporates the latest technology in electronics, motors, batteries, and materials. The arm offers state-of-the-art flexibility, strength, and dexterity to provide greater independence for people with forearm through shoulder-level amputations. “[This arm’s] functionality far surpasses anything that I’ve had so far,” said a participant who used the arm in DEKA’s clinical study. Mobius Bionics is now accepting names of people interested in owning one of the first LUKE arms. Protection against water and dust – offering peace of mind when used inside and outside the home. All of these features and capabilities are provided to the prosthetist as a complete system, eliminating any potential compatibility issues between joints or components. The LUKE arm is the result of years of research and testing by nearly 100 amputees for over 10,000 hours of use. Mobius Bionics is excited to be able to bring this innovative technology from the research lab to amputees everywhere. “Up to this point, design in prosthetic arms has been limited to incremental changes. We developed the LUKE arm to change the game for amputees – creating an innovative, integrated system that offers greater functionality and independence to our wounded warriors and other amputees,” explained Dean Kamen, President of DEKA. Mobius Bionics has chosen Universal Instruments Corporation (Binghamton, NY) to serve as the contract manufacturer for the LUKE arm. 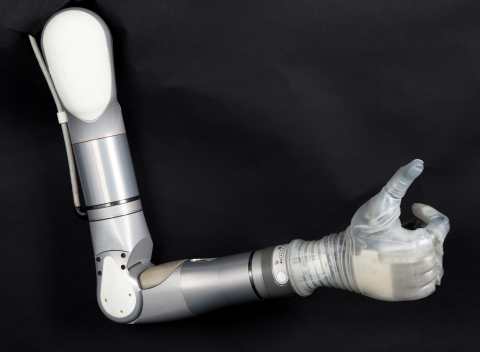 Mobius Bionics is leveraging Universal Instruments’ decades of experience manufacturing precision electromechanical solutions to produce the arm. “Universal Instruments is pleased to partner with Mobius Bionics to bring the LUKE arm to market, enabling greater independence for upper limb amputees,” said Keith O’Leary, CFO & COO of Universal Instruments. Mobius Bionics is preparing the arm for launch in late 2016. Contact Mobius Bionics to join the growing list of people interested in owning a LUKE arm by calling 855-MOBIUS-1 (855-662-4871) or visiting www.mobiusbionics.com. The LUKE arm was developed by DEKA Research & Development Corp. as part of the Defense Advanced Research Projects Agency’s (DARPA) Revolutionizing Prosthetics program with additional funding from the U.S. Army Medical Research and Materiel Command through a contract with the Army Research Office. Launched in 2006, DARPA’s program began with a radical goal: develop an advanced electromechanical prosthetic upper limb with near natural control that would dramatically enhance independence and improve quality of life for amputees. Working with DARPA and the Department of Veterans Affairs (VA) Rehabilitation Research and Development Service under a federal interagency agreement, DEKA spent years directly engaged with amputees in a number of studies, including VA studies, to better understand how the intersection of biology and engineering could ultimately lead to advanced prosthetic technologies. DEKA obtained performance feedback on the design from VA clinical optimization and take-home studies and DEKA take-home studies. “Working one-on-one with the amputees and learning what they liked and didn’t like about using prostheses proved invaluable to our product development process. Thanks to their insight and input, we have been able to construct the most advanced FDA-cleared design that the world of upper-limb prosthetics has seen to date,” noted Kamen. Since the inception of the Revolutionizing Prosthetics program, DARPA has supported efforts to bring this advanced technology to market with the objective that Service members with arm loss would regain the independence and capability that they lost. DARPA’s most recent support provides resources to assist in establishing Mobius Bionics so that the arm can be provided to amputees, particularly to veterans. Mobius Bionics is an innovative new medical device company focused on bringing advanced prosthetic technologies, such as the LUKE arm, to upper-limb amputees. Fueled by years of research-driven product development, the Mobius Bionics team brings together extensive experience in delivering pioneering medical technologies to market. To learn more about Mobius Bionics LLC or the LUKE arm, call 855-MOBIUS-1 (855-662-4871) or visit www.mobiusbionics.com. Universal Instruments Corporation is a global leader in the design and manufacture of advanced automation and assembly equipment solutions for the electronics manufacturing industry. Their unique products, engineering and production capabilities continue to draw new customers to Universal Instruments. For more information about Universal Instruments, visit their web site at www.uic.com.